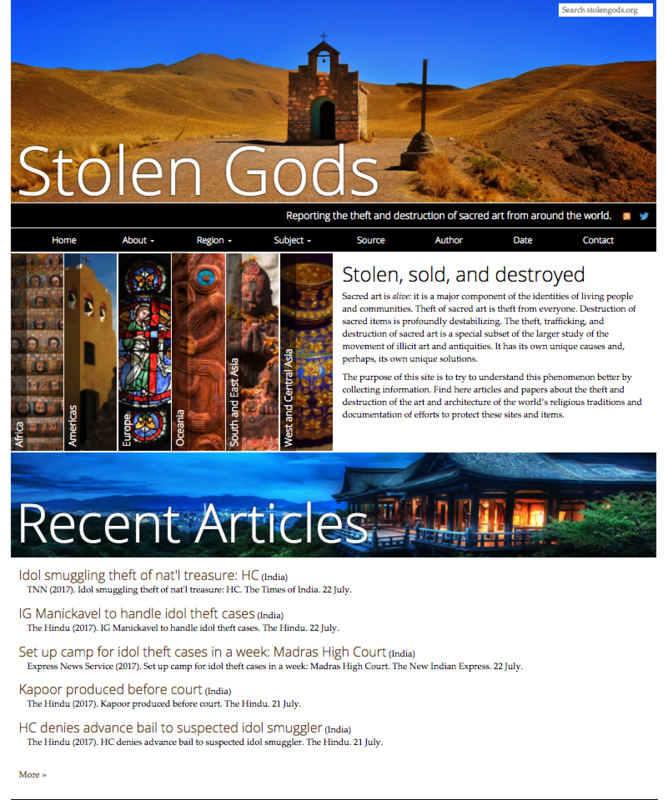 A few years ago I started StolenGods.org as a public repository of the popular media articles I was collecting during my research into the looting, trafficking, and destruction of Sacred Art. The spectacular, talented Tony Garnock-Jones, working mostly on my drawings, my gratitude, and bowls and bowls of ice-cream constructed a beautiful site to house the data, and people started using it for their own research. Ideal! We’re approaching 2000 articles in the database. Pretty good…or bad, bad that there is so much destruction of sacred art. Good that I’m able to share the data with you all. 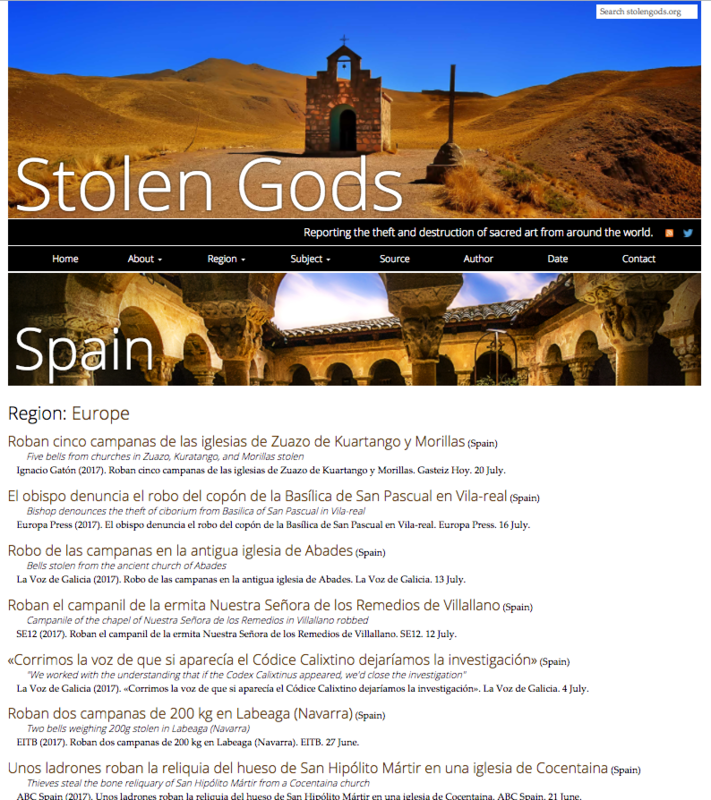 The experience inspired us to create the news.CultureCrime.org database, which goes beyond StolenGods.org in scope. It includes all articles (that I can find) about any aspect of antiquities or art crime, of which Sacred Art is a subset. At the time of writing, there were 7299 articles in the Culture Crime database. Again, good that I can share the data, bad that there is so much crime related to art. Sadly, over the course of this last year, StolenGods.org has been neglected. It was updated infrequently and there were big gaps in the database. The problem, you see, is that the updating of news.CultureCrime.org is largely automated. I am able to just upload my personal database and, again thanks to Tony, everything just happens. 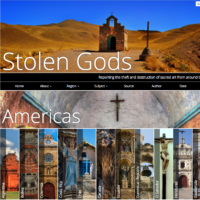 StolenGods.org, however, was built earlier in an entirely different way. It required that I hand re-enter each database entry and I just don’t have the time for that. Over the last year, I had a series of student volunteers help me with it but they all eventually went on to dissertation writing and as of the start of July, I had a backlog of 300 entries that needed to go up. But now, now, again through Tony’s efforts, the middle step is cut out and my personal database entries go on to StolenGods.org automatically. This means it will be updated more than weekly and will remain up to date as long as I keep my own database. That, in itself, is something to think (and worry) about, but for now and into the foreseeable future, you all can depend on both news.CultureCrime.org and StolenGods.org being kept current. 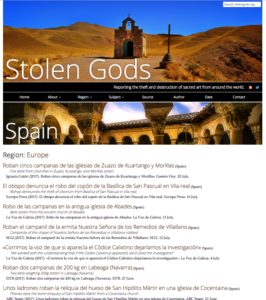 Some articles, those entered by the amazing Barbora Brederova and a collection of articles about Andean church theft, were on StolenGods.org but not my personal database. They are not YET on the new site, but they will be. The whole website is English-centric with a twist of Spanish: the two languages I speak. Barbora’s articles helped that a bit, but we’re lacking in anything else. If you have any ideas for the site or are using it for research or teaching, do let me know. I’d like to hear about it. Meanwhile I am going to start thinking about making the original database generation more sustainable, or at least less time consuming. I might be scouting our new master’s students for helpers!